Dome Teachers taught AA gunners to be calm and concentrate under realistic battle conditions. The precursor of modern computer simulators, military and otherwise, the domes and all the equipment within them represented a cutting-edge invention. Using ‘augmented reality’ – a blend of virtual or pretend reality and real life – the sole purpose of the teacher was to simulate the noise and conditions of an air attack with planes flying overhead, bombs exploding and bullets and shells being fired. The accuracy of AA gunners improved rapidly with training in the domes, helping to vastly improve the defence of Britain in her hour of most need. In the centre of all dome teachers stood a film projector and a moving mirror. 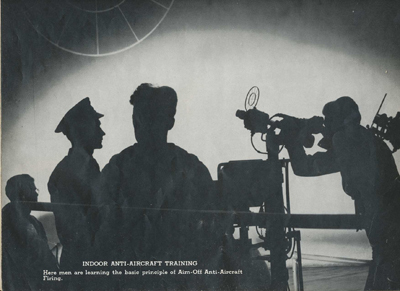 A film of an attacking aircraft was then projected onto the mirror and as the mirror moved, the aircraft projected onto it appeared to fly around the dome’s interior walls. Next to the mirror was situated a dummy gun which AA trainees used to ‘fire’ ahead of the attacking aircraft so it then flew into the ‘bullets’. This technique is called ‘aim-off’. 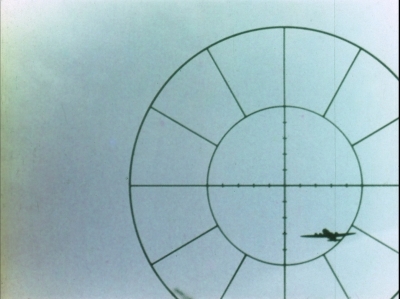 Where the trainees needed to aim was indicated by a yellow dot or line on the film but the dummy gun’s sights were tinted yellow so that the trainee couldn’t see this dot or line. 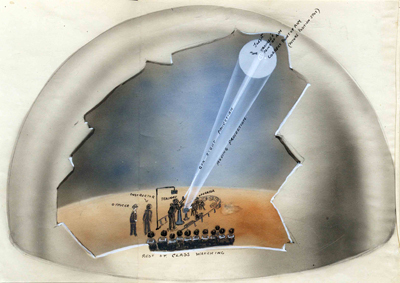 As the gun was fired, a copy of its sight (a graticule) was also projected onto the interior walls of the dome and if the sight appeared over the yellow dot or line on the film then the trainee gunner’s accuracy was ‘spot on’. An instructor could see both the gun sight and the spot or dot, so could monitor a trainee’s performance. But it wasn’t as ‘simple’ as that. All the time the trainee gunner was trying to concentrate and aim at the projected attacking aircraft whilst remaining calm, the dome was filled with a host of very loud sound effects to simulate real-life battle conditions. A variety of different dummy guns were used in dome teachers around the country. Based upon the the description provided by Tom Wright of 222 Squadron at Hornchurch, Essex, who was sent on a course at Langham Dome in 1943 – 44, there is a dummy Browning machine-gun in the newly-restored Dome for visitors to try out. If you have never been in combat it is almost impossible to understand the stresses military action can place on the human mind and body. To be able to train people for such an experience without actually putting them in harm’s way is an invaluable asset. Being dive-bombed by an aircraft can be a terrifying ordeal and in the early days of WW2, when aircraft attacked merchant navy ships for example, young, untrained gunners had been seen either simply shutting their eyes and pulling the trigger – or literally running away. The invention of the Dome Teacher, like the one at Langham, gave the military the opportunity to teach trainee AA gunners to overcome their fears and their instinctive reactions, to remain calm and to concentrate in what was a very life-like, battle situation. Gunners were first given theoretical lessons in how to aim at a fast-moving target and then practised in the Dome. Later, they would be taken to the nearby range at Stiffkey to fire live ammunition at targets towed by aircraft. Inside a wartime Dome Teacher. Courtesy Dr. Jay White, Halifax, Nova Scotia. 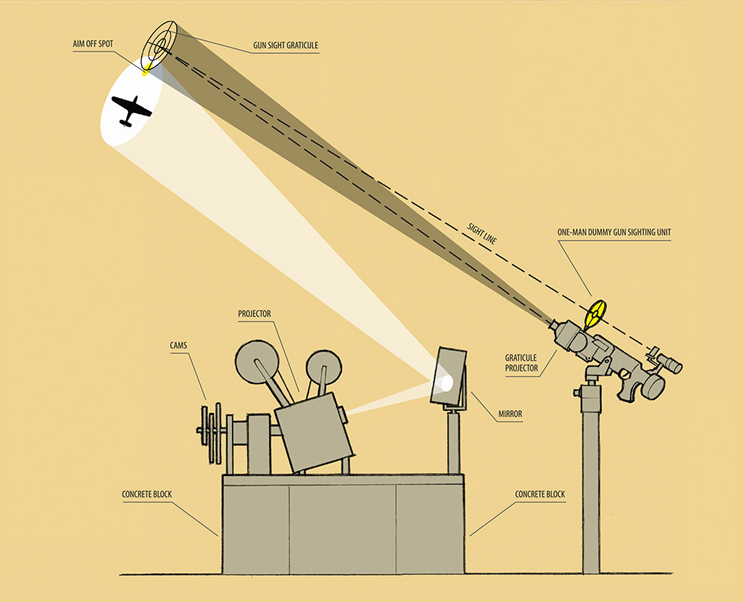 How the projection and gun system workedBased on a sketch by Frank Phillipson. © Ugly Studios. Projecting onto the curved wall of the Dome creates the illusion of depth. © Estate of Henry Stephens. A Trainee's-eye view. © Huntley Film Archive Ltd.